Guy at work asked for a recommendation of a Blow Forward Device for his AR15. "One day I'll pop for a suppressor, but the BFDs range in price from $35 to $200." I asked him what he wanted it to do. He wasn't trying to alleviate recoil, but wanted less of a fireball. Oh, so a flash hider? Not a compensator. Look it up again and get back to me with another name, buddy. I'm not sure what you are on about. Or, more likely, YOU aren't sure what you are on about. New one on me, if so. Most call them "blast shields". They direct concussion and blast forward, making unsuppressed sbrs a little less unpleasant, but they actually increase recoil slightly because now everything is moving forward. Also, they prevent the flash suppressor from effectively turbulating (that's a word?) the escaping gasses, so the fireball is enhanced. Almost as bad as a bare muzzle with no hider at all. 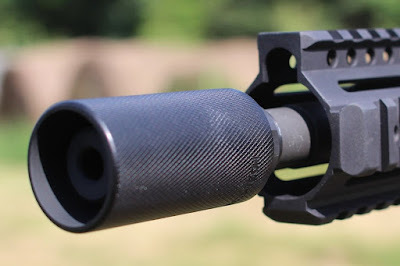 Since suppressors and flash hiders are streng verboten by our elected betters, I would not be surprised if something was developed to suppress flash and noise that would not be considered a suppressor or a flash hider except by its effect, enabling it to be called something different.